And, of course, there are more books on the way. There are now upward of 15,000 books about Lincoln, more than about any other person except Jesus (though there are more about Lincoln than about God, reckons Baker). In our lifetime Lincoln has supplanted Washington as the most revered president. Might this change in the future? I don't see that changing. Are they making some sly Barry O reference? I did so because this is the actual kind of dialog that is currently conducted by those who call themselves 'scientists'. Instead of actually having a discussion about scientific ideas offered by dissident scientists, the mainstream scientists have punted on discussing science and instead just offer fear mongering and ad-hominem attack. It's really indistinguishable from political moonbattery. Don't buy that this is the way it is? Well, as it is said, truth is stranger than fiction. I've already pointed out an analysis of the TIME image that castigates TIME magazine for going so far as to actually allow that there is a debate. Apparently, the editors of SEED got the letter - not mine - the real letter that went out. This iconic image serves to represent how 'science' has approached the controversy in the public square. The chimpanzee represents the accepted assertion that humans descended from non-human ancestors (this despite the fact that no one, not even evolutionary gradualists believe that humans descended from chimpanzees. It is asserted that they have a common ancestor - one which we have no evidence or proferred model for.) and that such facts (representing the entire scientific community) are enraged, incredulous, and frustrated with the co-opting of 'science' by the disguised thumpers. And there's no worry about the relative positioning of science and God in this image - there is only science - nothing else. ID Scientist: So, can we discuss, say, irreducible complexity? Scientist: Of course not, I won't even participate. You are just trying to sneek in the baby Jesus. ID Scientist: No, I mean can we talk about several examples of organic structures, like flagellates, the mammalian eye, and components of living cells that have interdependent macro structures which are problematic for an explanation that involves gradual additive actions over a period of time. Scientist: No, look, Intelligent Design equals the baby Jesus. Irreducible complexity is the baby Jesus. ID Scientist: Well, can you proposed a model, a theoretical model that accounts for interdependent organic macro structures developing over time? Scientist: Baby Jesus! Baby Jesus! You are forcing me into Sunday School! So much for the practice of science. Science is supposed to reflect a process of thesis-antithesis-synthesis. Instead we get demagoguery. 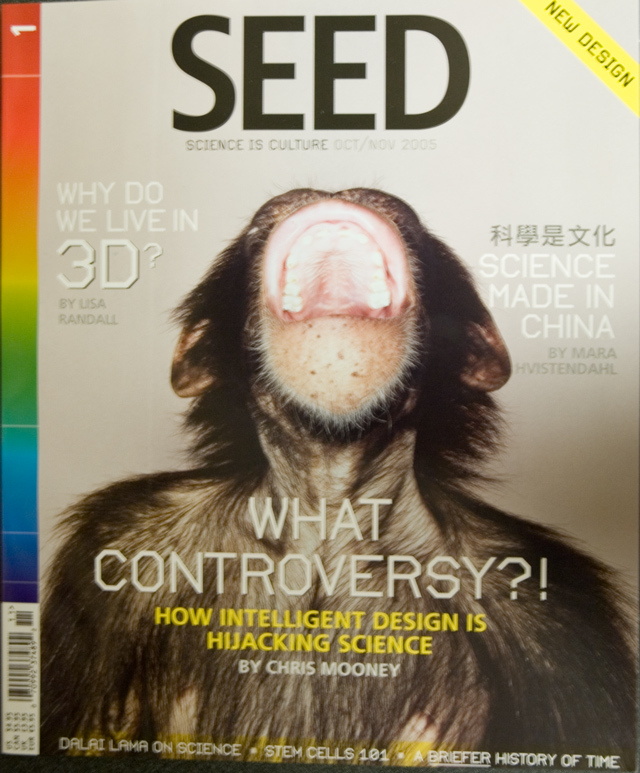 Curiously, SEED asserts in this issue that it (the magazine) has a new design. The editors have intelligently realigned layouts and content in the magazine to make it more likely that it will survive in the plethora of magazine species. Using the current logic of science, it would be reasonable to suppose that if we were to peel back that top right hand corner, we'd see a picture of the baby Jesus. *I mean figuratively - there is an article touting the scientific value of Buddhism in the issue. Please excuse the length of this post. Based on the interest in my recent post about the "Civil War" call to Michael Medved last Wednesday, I decided to transcribe that part of the radio show and reproduce it here. I will follow this up with a series of posts which will analyze how we have gotten to the place in the national dialogue in which those of the 'progressive' stripe are seriously proposing (and sometimes executing) violence against their fellow citizens. At the outset, I will tell you that it is my view that the blame rests squarely on the leadership of the Democratic party along with their supporters in the MSM. Their tacit embrace of bizarre conspiracy theories and constant fomenting incites violence. Note: This isn't professionally transcribed - it's just from listening to the media clip that I produced from the radio show. Sometimes (as it is in this case I believe), the written communication has more impact than that of the audio alone. Medved: Let's go to Mike in Tampa Florida, you're on the Michael Medved show. 'Mike': I am one of the angry, um, less depressed, I'm getting over the depression, and now just harboring the anger, but I did find it amusing that, uh, those young people beat up the Republicans. I think that's fabulous. I think there needs to be more of that. Medved: You don't really believe that, do you? 'Mike': I absolutely endorse it. I, I wish this country would break into an all out Civil War. Medved: And why do you think your side would win? Which side has more guns? 'Mike': You'd be surprised, pal. Medved: I would. Actually I think most gun owners, uh, voted for President Bush. 'Mike': That's.. uh ...You don't know who owns the guns. That's the problem. 'Mike': You think you know who owns the guns. Medved: So, you think your side has a lot of secret guns and they're just waiting for a moment like this? 'Mike': No.. but, I mean. Did you?... I mean, what, what point do you mean - you say "Who do you think is go[ing to] win?" It doesn't matter. Even if I got taken out it wouldn't matter to me - as long as I had a chance to take out some of you. Medved: You, you don't really believe that do you? 'Mike': I feel it to the very depth of my bone marrow. 'Mike': Because I hate Republicans. Because they, they oppose freedom. They oppose civil liberties. They, they're nasty, stinking, Jesus freak weirdoes. I mean, I can't stand you people. Medved: Uh, and, you, uh, I take it, were you active in the Kerry campaign? Medved: And do you have any 'friends' who are Republicans? Do you know any Republicans personally? 'Mike': I have family members that are Republicans. Medved: And, so.. uh... did... you, what are your big issues? You mentioned civil liberties. What else motivates you to the kind of fervor that you're expressing for the Democratic cause? 'Mike': The corruption of this, this administration. [Uh], the Bush family is, is probably the most corrupt crime organization to ever exist in the history of this nation. I mean, do you, do you have any idea how many trillions of dollars that they've helped swindle from this country? I mean, just beginning, just beginning with the whole Iran-Contra thing - which had nothing to do with liberating, you know, people down in Central America. It was all about money and shuffling wealth. I mean, it's a[n] absolute farce. 'Mike': [Talking over] And, and you're still pulling this garbage. 'Mike': You're still pulling this crap. Iraq has nothing to do with the freedom and democracy or fighting terrorism. It's all about exchanging wealth. 'Mike': What do, What do you think goes on with the military? Why is, I mean, what good - what's percentage of our budget now is in defense is it what thirty, thirty-five percent? Medved: So tell me, tell me Mike, how would you deal intelligently with the Taliban freaks? 'Mike': The Talib[an] you, you have to smoke them out with intelligence and [track?] with them. You can't, you can't go into Iraq the way we have done. You - the only thing we did was draw Taliban people into [unintelligible]. Medved: [Talking over] What would you like, when we come back, um, would you be willing to take some calls from some of your fellow citizens here? 'Mike': You got about four minutes. Medved: Well, that's right. I have a commercial. That's, it's, because, we on the Republican side believe in, uh, uh, actually, the, the profit motive and the free market system. Stay with me if you dare and let's see if you can take some calls from your fellow citizens. We'll be right back with, uh, Democratic distress. Medved: Thirty four minutes past the hour on the Michael Medved show. Uh, talking about, a tendency on the left, you also saw it on Bill Maher's web site, this was before Bill Maher was slapped with a big lawsuit, nine million dollar lawsuit today from his former girlfriend, but that's, we'll leave that one alone. Let's go back to Mike in Tampa because he expresses the same kind of sentiments that were expressed on the Bill Maher web site where people are talking about a [laughing] final solution to the Republican problem and they actually mean, killing people. And what you're saying, is, you're not saying Mike in Tampa are you that would actually consider going out and doing violence against, uh, your fellow citizens are you? [pause] Mike, are you there? 'Mike': Yeeah, yeah, I'm here. If, ah, I would say that if, if, I would say that if a movement started, then absolutely. Medved: So in other words, if you had some of your friends, uh, you could imagine yourself doing a version of like what, uh, Tim McVeigh did at Oklahoma City? Medved: How would you do it? 'Mike': What's happening, what's happening now with this government is, is with Patriot Acts one and two, and, and now three - they're proposing three now and it will probably pass. You, you're such, you don't even know. You, you no longer live in a free country Mike [Medved]. I don't know if you even realize that Ok? 'Mike': [unintelligible] They are so stupid Mike [Medved]. Medved: I'll give you a chance to express yourself. Try to answer my question. You, you would like to see a movement. What would this movement do, in terms of, ah, striking out to liberate America? 'Mike': Well, what happened in the Civil War. You know, I mean, war breaks out, you know, a skirmish starts over here, word travels, and war, you know, skirmish starts over there. How did the Civil War start? Medved: Well the Civil War started because there were legislatures that declared themselves separate governments. 'Mike': You also had... They started the secession in South Carolina which was the first state to secede. Medved: Right, but the legislature voted it. Do you think, do you think that the legislature, say Massachusetts would vote to secede from the Union? Would you move up to Massachusetts? Medved: Uh, can I, can I? 'Mike': ... whether we go back to a Republic, the true Republic that we should be. Medved: Mike, can I ask you a question. Do you work for a living? 'Mike': Do I work for a living? 'Mike': No, no, every, everything is just given to me Mike [Medved]. Of course I work for a living. What kind of stupid question is that? Medved: Well I just, uh, what kind of work do you do? 'Mike': None of your business. Medved: Well, I'm just, uh, we're, we're, you're talking about fairly radical action, I thought that would be interesting actually. But let's go to Greg in Simi Valley, California who's eager to speak with you on KRLA. Uh, Greg, you're on with Mike in Tampa Florida. 'Mike': ...[unitelligible] country you moron! Greg: You're talking about diplomatically coaxing out Muslim terrorists with shooting Republicans. That makes a lot of real sense. Greg: [talking over] You said, You said you would deal with the terrorists, deal with the terrorists diplomatically on some level. Yet you are ready to shoot other Republicans? Greg: Are you going to shoot your family? 'Mike': This is the whole problem with Republicans, you're all idiots. Greg: Your own family is Republican? You're going to shoot your family? 'Mike': You're an idiot Greg. Greg: Yeah, you sound like a real bright one there. 'Mike': [unintelligible, talking over] You're an absolute moron pal! Greg: [talking over] I wouldn't count on you getting anywhere. Medved: Ok, [unintelligible] Mike, I think that Greg makes an interesting point. You did say that we should use a less violent means to deal with the Taliban, right? Greg: [talking over] Yeah, you want to consider us Jesus freaks? Well, what about Mohammed freaks? 'Mike': ...and find the real people. You need to use our intelligence. It doesn't make any sense to use a shotgun to kill a fly stupid. Mike, Mike, here's, here's the point Greg's trying to make. Greg let me try this for a moment, because, you make a great point. You say we shouldn't use a shotgun to kill a fly, we shouldn't use shotguns against people who murdered three thousand Americans, but, you did want to use a shotgun against Republicans, you said. Greg: You said it was true. Medved: So this is, you are speaking metaphorically. You don't really want to see Civil War? Greg: You changed your tune. 'Mike': No, no, you, Mike, you are, you are really not that sharp a guy to have a nationally syndicated show. Greg: ...someone asks you a direct question, you don't answer it right - well that's the, that's the problem. You actually need to speak in real terms. He asked you flat out are you saying actually going out and killing somebody and you said "Yes, I would endorse that." Medved: Ok, Ok, let's, if you can continue with us Mike, I want to give you a chance to get your point across because I think it's, um, illuminating, VERY illuminating. I hope you'll stay with us. We'll be right back. Medved: Forty four minutes past the hour on the Michael Medved show and I'm actually getting kind of serious about this idea of hate crimes on the left. I mean you have to be serious about it. With all of the attacks and break-ins at Republican headquarters - there were two dozen of them during the campaign. After the campaign, after the Republican victory - in Raleigh, North Carolina, a mob of people came in and vandalized Republican headquarters there. On election day in Milwaukee there was real voter intimidation with Democrats slashing the tires of Republican vans. A, uh, kid, a seventeen year old kid was beaten up with a baseball bat and a padlock because he taunted some Kerry supporters - he was beaten up in the parking lot of a zoo, for goodness sake. All of this is going on and I do think it's serious. Now, I also think that you ought to be a little bit alarmed about our caller Mike in Tampa who hung up - I would have kept him on. I am - I want to tell you something, I am always cautious on this kind of thing - about this kind of thing, because, sometimes you worry it's just somebody who's roll playing who's trying to make Democrats look bad, but we kept him on long enough that this guy was for real. And he was talking very directly about violence being justified against Republicans because his freedom was being taken away, his country was being taken away. When people hear this repeatedly from the Michael Moore's of this world, I think it is, uh, grounds for legitimate concern. Kind of creeps me out. Can you imagine if a, if some talk show host, if somebody called on a Republican show, or a Demo[cratic], I mean in other words, if a Republican had come on and said the same thing, uhhhh, can you imagine what a huge issue it would be? UPDATE: the UNPOPULIST, Anniee Blackheart, The Asylum and Michael Williams posted/linked/referenced (For many of these h/t to ACE!) my original post. UPDATE: Great new blogger In The Right Place links from the excellent post here. Michael was talking about Post Election Selection Syndrome today and talked about the assault on the young Apple Valley man in Minnesota. Michael invited Democratic callers to talk about how they were feeling. After a call or so, he got a guy named Mike on the phone that said "not only do I condone the attack that happened, I applaud it and hope that it happens everywhere." He further stated that he hoped there would be a "complete Civil War between Democrats and Republicans" and began spouting 'Mooreisms' about the Bush dynasty, war for oil, etc. I think Medved was genuinely taken back for a moment, then asked "Who do you think have more guns, Republicans or Democrats?" Mike answered him "You'd be surprised at what we have." He proceeded to belittle Medved personally and threaten every Republican in the country. Medved attempted to get him to stay on the line (I hope to trace the call!) - but I don't know what transpired after that. As I have already pointed out, no prominent Democrat has publically called for an end to this escalation of violence and threats of violence. The party that uses hate to describe its opponents of appeasement in foreign affairs has spawned thugs to carry out its hate domestically. UPDATE: I put together a clip of the Medved show featuring caller 'Mike' here. This is just a bit beyond moonbatting, don't you think? UPDATE: (November 15th) - Over the weekend, I transcribed the portion of Medved's show with "Civil War 'Mike'". The transcription post is here.